I was pondering physical therapy the other day. Well, lots of days, lately – prospective careers demand a great deal of pondering. I have had such great experiences with therapy. 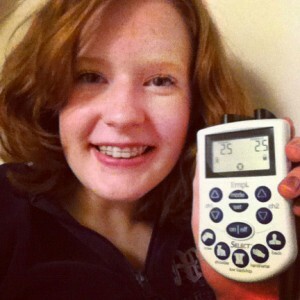 Doing the hardest exercises in the world, the easiest, learning how to use new machines, learning new stretches and how to decide what pain relief technique is the best (ice, heat, electric stim, rest, deal with it, etc. ), and, of course, when to stop exercising because the injured place was hurting. A lesson in self-control that I need a lot. But in my thinking, although I did not experience complete physical healing from my injuries, something in my heart was healed at therapy every time. God used my doctors and physical therapists to help renew my energy and give me the determination to be strong in dealing with the injuries. 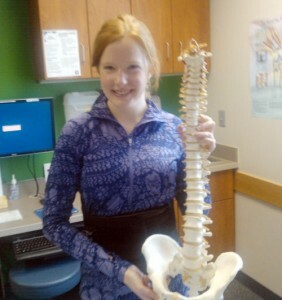 In early September of 2012, I was diagnosed with spondylolysis which, for me, meant a stress fracture in my lowest lumbar vertebrae (L5). This type of fracture is very small and seemingly insignificant – mine wasn’t even visible on an X-ray. But, after several months of back pain, I was incredibly thankful to have a specific diagnosis, knowing that it could be treated. I went for physical therapy at a Summa location, and I was very excited to see my physical therapist again (I had seen her a few years prior for a different sports injury). We had fun. She did not like my “corset” back brace from my first sports medicine doctor at all, and after making an extra stabilization insert for it, asked him to order a chairback brace for me. 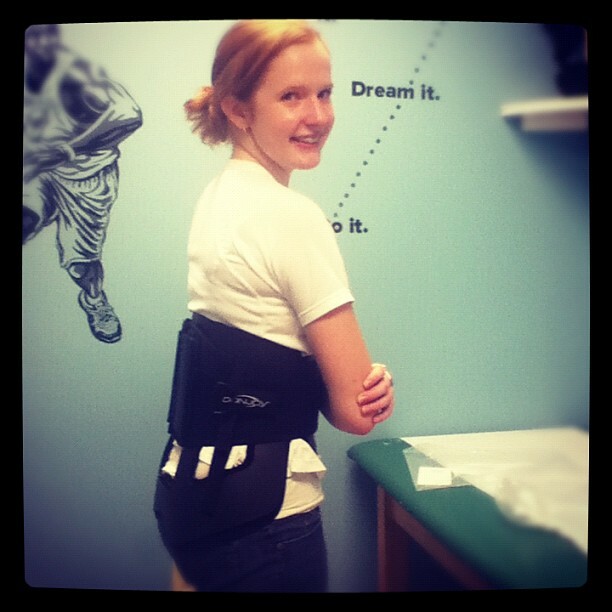 My second physical therapist later called it a “turtle shell,” and I couldn’t agree more. It is extremely confining. And then, she became immensely vexed that my back was getting worse, even with the new brace, and sent me to a new doctor, Dr. Joe Congeni, at Akron Children’s Hospital in late October 2012. He is the best. Laughing at my love of using large medical words when possible was a wee blow to my pride, but in the end, he ended up being just what my back needed. After using a new TENS unit (electric stim) and wearing the new back brace and sitting on my bum for an eternity didn’t reduce the pain, Dr. Congeni suggested that I go to physical therapy there at the Center for Orthopedics and Sports Medicine. Honestly, I wasn’t expecting very much from the therapy at Children’s. I was so tired of trying to figure out what was wrong. The pain had taken a toll on my emotions, and I was incredibly depressed and discouraged, despite my best attempts to try to find good in my injury. But wow, my opinion changed after evaluation. I can’t tell you how much therapy, and my new physical therapist, blessed me. What still makes me smile and wonder at God’s goodness is how my “I’m doing fine” mask just didn’t work there. I laughed so much there, and thankfully, in the end, was not whining and complaining about having to lower my ballerina-dignity to do pre-pilates exercises. Back pain still wasn’t fun, but I received the encouragement to bear it with joy. And no, my back still is not better, but God is still my Healer. I’m learning patience, slowly but surely. It’s been nearly 11 months since it started hurting. Where I needed to be healed the most through this injury, even more than from lingering back pain, was to stop trying to prove myself strong enough. The worst was when I was teaching my kindergarten class at church and I couldn’t run with, play with, or carry them. All of it was learning to give up, to accept weakness. And I’m not saying that we shouldn’t work to improve or overcome a weakness in our lives. We totally should. But there are times when we strive to be who we aren’t, who we weren’t meant to be at the moment, and it’s a mess. And moaning about not being perfect at the beginning, or even the middle of the journey, is pointless. Instead, we need to press on to the goal amidst what we deem as setbacks. 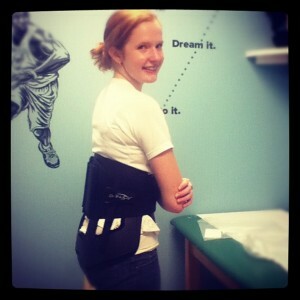 So what has physical therapy taught me? To think positive. To see pain as a new adventure and learning experience. To be very patient through the pain. But also to say that it’s okay to be broken. And knowing how much my physical therapy experience here at Children’s has helped me, I’m excited to love other people as a physical therapist, people who probably had so much more to lose in a sports-related injury than I did. To love them and encourage them and to remind them that healing takes time and that even that the process of healing is beautiful. Just like my physical therapist at Akron Children’s did for me. I am so, so excited! Awesome bit of writing 🙂 very proud of you! Michelle, I loved reading your story!! You are lovely inside and out! !